Public Paranoia? The SECRET to overcoming fear.. The driving force behind most Americans today is fear. Mass media images instill fear of being too big, thin, ugly, beautiful, poor, rich, old, young, smart, dumb, unloved, unwanted… Fear of death, tragedy and failure. Buy this drink-lose weight now! Use this alarm system-or someone will break into your home! Drive this car-or you may crash! Eat this food-you will live longer! Invest in this-you’ll never go broke! Fear drives us to believe we need one more zero behind our salary to bring happiness, a bigger house, and a fancier car, nicer clothes, send our children to prestigious schools. We do everything to “measure up” however, we are never satisfied. Want to know why? Possessions do not bring fulfillment. Happiness (fulfillment) comes from within and it only comes when you realize that the reason of your existence is to further your creators agenda. Not your own. Material things are nice to have, but when your sole focus is on acquiring instead of giving (time, love, friendships etc ..) to others you will never feel complete. “Our deepest fear is not that we are inadequate. Our deepest fear is that we are powerful beyond measure. It is our light, not our darkness, that most frightens us. We ask ourselves, who am I to be brilliant, gorgeous, talented, fabulous? Actually, who are you not to be? You are a child of God. Your playing small doesn’t serve the world. There’s nothing enlightened about shrinking so that other people won’t feel insecure around you. We are all meant to shine, as children do. We were born to make manifest the glory of God that is within us. It’s not just in some of us; it’s in everyone. And as we let our own light shine, we unconsciously give other people permission to do the same. As we’re liberated from our own fear, our presence automatically liberates others” Marianne Williamson http://en.wikipedia.org/wiki/A_Return_to_Love this is one of my favorite quotes on fear, we are who we are because it’s written into a well-designed plan. Before being formed in our mother’s womb God called us for a purpose. Will you live up to it? Analyze: What is causing the fear(s) get to the root of the situation. Confront: Is the fear logical? 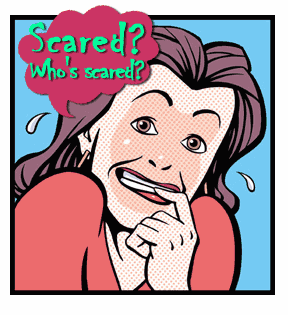 What is the likelihood of the thing you fear to take place? Replace: Think positive! As complex as your human brain is; it can only handle ONE thought at a time. This entry was tagged Fear, God, Marianne Williamson, Second Epistle to Timothy, Timothy, United States. Bookmark the permalink.